You don’t have to look very hard to find lucky bamboo nowadays. These plants pop up in offices, on desks, in businesses, and in homes pretty much everywhere. 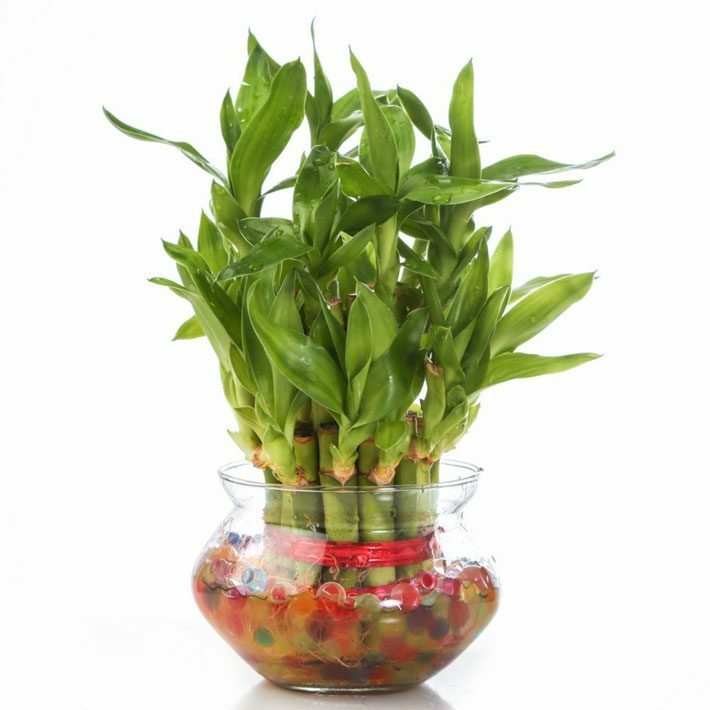 An important part of feng shui, lucky bamboo plants are said to bring good luck and fortune, especially if the plants were given as gifts. It also helps that they have a well-earned reputation as nearly indestructible. These tough stalks can survive in vases of pure water or in the soil, and in a wide variety of light conditions. Even a poorly kept lucky bamboo plant will live for a long time before it finally succumbs. Technically, lucky bamboo is not bamboo at all, but a species called Dracaena sanderiana. 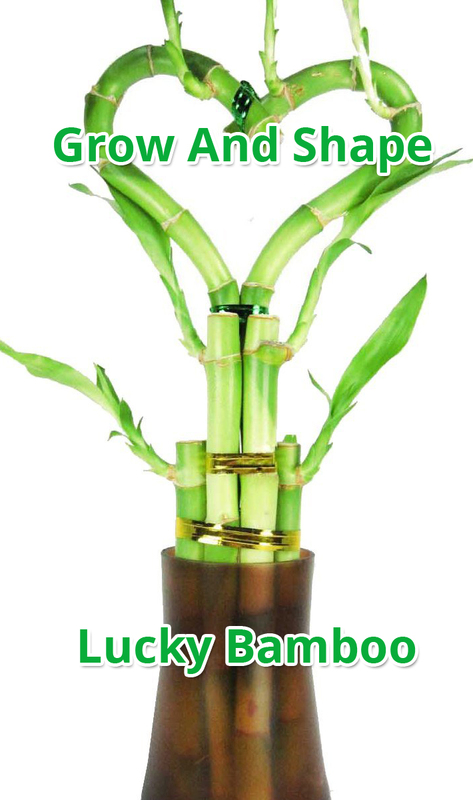 Although most are grown hydroponically (in water), lucky bamboo can be potted up in the soil. One final caution: lucky bamboo leaves are mildly toxic, so they should not be kept in a place where pets or children are likely to snack on them. Light: Lucky bamboo prefers bright, filtered sunlight, such as found under a rainforest canopy. Avoid direct sunlight as it will scorch the leaves. They are more tolerant of too little light than too much. If the plant begins to stretch, however, or the green fades, provide more light. Watering: Lucky bamboo can grow indefinitely in a simple vase filled with pebbles (for support) and at least an inch of water. However, they are very sensitive to chlorine and other chemicals commonly found in tap water. Water your lucky bamboo only with bottled or distilled water, or tap water that has been left out for 24 hours to allow the chlorine to evaporate. Healthy lucky bamboo roots are red, so don’t be alarmed in a glass vase if you can see red roots. Finally, good hygiene recommends that you change the water weekly. Temperature: Lucky bamboo likes warmer temperatures of between 65 F and 90 F. Do not place the plants in front of air conditioning or heating vents. Trimming, however, is an important part of keeping your lucky bamboo healthy. Over time, most plants will become top heavy, or intricate shapes will begin to lose their form. In general, it’s not a good idea to cut the main stalk of a lucky bamboo. Instead, cut the offshoots with sterile snippers. You can trim offshoots back to within an inch or two of the main stem. New shoots will soon emerge, and the resulting plant will be bushier. To discourage new growth, dip the cut end in paraffin. If you want to change its shape dramatically, you can cut a whole offshoot flush against the main stalk. A tan scar will result, and new shoots may or may not emerge from the cut. Don’t throw the trimmings away, as they can be used to propagate new lucky bamboo plants. 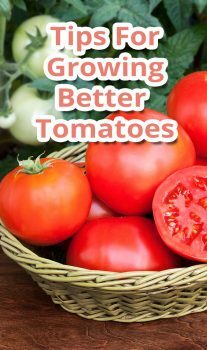 If you need to trim the main stalk for some reason, new shoots will emerge from below the cut, and the top portion—assuming it’s healthy—can be used to start a new plant. The most common mistakes related to lucky bamboo are usually connected to the water. Chlorinated water will kill them over time, and water that is dirty or infected with bacteria can be deadly. If a plant develops black roots, these should be cut away. Similarly, dead leaves should never be allowed to rot in the water as they might introduce bacteria. Practice good water hygiene by changing the water every week with distilled or bottled water. If algae are growing in the water, it’s usually because the plant is potted in a clear vase, allowing light to penetrate and encouraging algae growth. Just clean it out and start again, switching to an opaque container if algae is a persistent problem. Brown leaves usually indicate dry air or polluted water. Raise the humidity level by spraying the plant regularly and make sure you’re using the appropriate water. Finally, lucky bamboo is susceptible to the same insect problems as other indoor tropical plants. 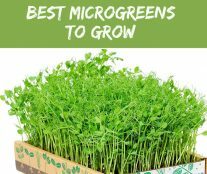 They can be treated manually (picking off bugs) or by the same methods you’d use on any other indoor plant.